I decided to have a look at grounds (and specially at slopes, foundations and sidewalk, if i can put some snow on it). Here's the first screenshot: foundations. I would like to make also an arc, like in pak96.comic, i'll try to see how does it look. EDIT: the pic is big and it is hosted on my server. Right click and select View image to see it in its full dimension. on the bottom row, there a fundament seems to be transparent. Texture seems a little bit oversized, though. Well, of course my statement was concerning the full size screenshot. ...It's nice. I like it. Some more work on foundations. Feedback is appreciated, if the quality is enough, i'll release the sources for the main pak. I like it. Very cool! But listen, you'll have the pavement from the arcs on the water, if the slope was placed on the riverside. The same procedure as shown in p96c. If (or when) the quality is high enough, i'll release the sources for the main pak. Very very nice. But some little things. The shadow on the darker side should be from top to bottom not from bottom to the top. Or is it a reflection from the bottom? I think the shadow on the sunside is to long. Your shadow need a very very high sun. Thank you! I'll post it like this, because i'll be offline for a few days and it can go in nightlies. I'll work to shorten the shadow on the S side. On the E side, it is from SE to NE. On the bottom (and sometimes in the middle) there is some dark patch which comes from infiltrations and humidity in the wall. no pak files just images? 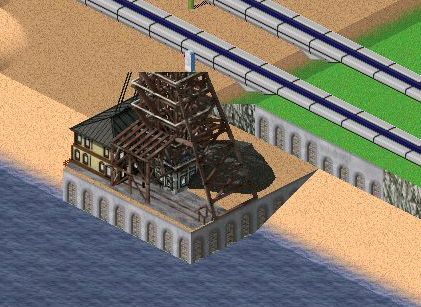 I took a short break from rail tracks, so I dug out this old project I had. I quite like the rocky texture, I will try to edit it also as a rocky/alpine climate ground. I will now try what I can do with city "artificial" slope walls, I just have a couple of ideas. Actually same comment than in 2009 from ALex: Those rocks are somewhat too large. NB: What could help to solve the brick problem: go for sandstone quaders. Looking at those pics, my texture seems quite in scale. About bricks: I'll use the texture from bridges and tunnels (half the size of the 2009 attempt), it might still be a bit too big, but at least is consistent with many other objects in the pakset. Those Pictures are very great. I Think we need a Timline for texture. The size of the rocks is quite ok i think. But there's a more fundamental problem with all such textures. Repetition. The pattern from repetition is the first thing i see, and this feels very unnatural. I agree. I mean this mark (see joined file) is a main cause. If you delete it, the result will be better imho. But there's a more fundamental problem with all such textures. Repetition. The pattern from repetition is the first thing i see, and this feels very unnatural. This is a very big and known problem, unfortunately :( (same apply to roads, to a certain extent). It would be great if we could provide 3 or 4 different variants and the program picks randomly (or with a logic which appears random to human eye). Another problem is that top and bottom borders would look better if slightly jagged, but my test lead to nowhere: either it leaves empty spots, either is hidden (bottom) or overrides what's built on the slope (top). But as it is now, sure it's an improvement over the old texture. I'll try to fix the mark pointed out by mEGa, then commit this one and work on the city artificial walls. Ok, fixed and committed in r1056. I want to thank James Petts for inspiration about narrow arches: i got this idea reading here and here. I hope you like it, sure it's an improvement over old huge bricks. a more fundamental problem with all such textures... Repetition. Clearly, underground textures should depend on the underlying terrain, which in turn should also impact whether clay mines, coal mines, or stone quarries get generated in that area! ....Oh, wait, this wasn't Simugeology? The building basement walls looks good out, but i wish me a timeline of basements wall. Those Walls was be build in the in the years 1750 until 1950, after 1950 comes basements in concrete. This is strange, but likely related to the game engine. However the variety it creates is interesting, I will investigate. Interesting. Game engine choice: it's choosing one graphics for the first tile (left one) and the double height graphic for the right tile. Probably due to the fact that the left tile has flat ground in front of it and the right tile has a slope down to the water. We never noticed it before because the previous graphic wouldn't have shown that difference. Is there a way you can color ground tiles to match nearby objects? For instance I may wat grey ground around my airport taxiway as an apron, or white ground under high speed rail. Or even brown ground for dirt. Any thoughts?